A symbiosis is an evolved interaction or close living relationship between organisms from different species, usually with benefits to one or both of the individuals involved. Symbioses may be ‘obligate’, in which case the relationship between the two species is so interdependent, that each of the organisms is unable to survive without the other, or ‘facultative’, in which the two species engage in a symbiotic partnership through choice, and can survive individually. Obligate symbioses are often evolved over a long period of time, while facultative symbioses may be more modern, behavioral adaptions; given time, facultative symbioses may evolve into obligate symbioses. Endosymbiosis is a symbiotic relationship, occurring when one of the symbiotic partners lives within the body of the other. Endosymbiosis can take place either within the cells (intercellular symbiosis) of the ‘host’ organism, or outside the cells (extracellular symbiosis). On the other hand, ectosymbiosis is a symbiotic relationship in which one organism lives on the body surface of the host, including the lining of the digestive tract, or exocrine glands such as mucus or sweat glands. Mutualisms are a form of symbiosis in which both symbiotic partners benefit from the interaction, often resulting in a significant fitness gain for either one or both parties. Mutualisms can take the form of resource-resource relationships, service-resource relationships, or service-service relationships. Resource-resource mutualisms (also known as ‘trophic mutualisms’) happen through the exchange of one resource for another between the two organisms involved. Resource-resource mutualisms most often occur between an autotroph (a photosynthesizing organism) and a heterotroph (an organism which must absorb or ingest food to gain energy). Most plants have a trophic mutualism called a mycorrhizal association, which is a symbiosis between the roots of the plants and a fungus. The fungus colonizes the plants roots and is provided with carbohydrates, sucrose and glucose. In exchange, the plant benefits from the fungi’s higher water and mineral absorption capabilities. Service-resource mutualisms occur when the symbiotic partner provides a service in exchange for a resource reward. One of the best known examples of this is the exchange between plants and their pollinators. While visiting the plants to gain a supply of energy-rich nectar, the pollinator (insects, birds, moths, bats, etc. ), provides the plant with the service benefit of being pollinated, while ensuring their own pollen is distributed when the pollinator visits more plants of the same species. A rare form of mutualistic symbiosis comes in the form of service-service interactions. As the name suggests, both of the symbiotic partners receive a service, such as shelter or protection from predators. For example, the close relationship between anemone fish (family: Pomacentridae) and sea anemones provides both partners with protection from predators. The anemone fish, which have evolved an extra thick mucus layer on their skin to prevent them from being stung by the anemone’s nematocysts, are provided with shelter from predators and a place to breed, while aggressively chasing away other fish which may try to bite the ends off the nutrient-rich tentacles. However, it is argued that there are very few truly service-service mutualisms as there is usually a resource component to the symbiosis. In the case of the anemone-anemone fish mutualism, the nutrients from the anemone fish waste provide food for the symbiotic algae, which live within the tentacles of the anemone and provide energy to the anemone through photosynthesis. In this way, symbioses are shown to be highly complex and indicative of the delicate balance within ecosystems. Commensalism is a symbiosis in which one organism benefits from, and is often completely dependent on, the other for food, shelter, or locomotion, with no obvious effect on the host. The relationship between whales and barnacles is an example of commensalism. The barnacles attach themselves to the tough skin of whales, and benefit from widespread movement and exposure to currents, from which they feed, while the whale is seemingly unaffected by their presence. On the opposing side of commensalism is amensalism. This occurs when one organism is inhibited or damaged by the presence of the other, who does not benefit. Amensalism may involve competition, in which a larger, more powerful, or environmentally better adapted organism excludes another organism from its food source or shelter; for example, one plant shades out another while growing at its normal speed and height. Alternatively, antibiosis, where one organism secretes chemicals as by-products that kill or damage the other organism, but do not benefit the other, can be seen commonly in nature. Parasitism is the non-mutualistic form of symbiosis, occurring when one of the organisms benefits at the expense of the other. Unlike predation, parasitism does not necessarily result in direct death of the parasitized organism, and often it is imperative to the life cycle of the parasite to keep its host alive. Sometimes the parasitized host is killed as result of parasitic invasion; in this case, the invader is known as a ‘parasitoid’. Parasitism may involve direct infiltration of the host body to feed off tissue, influencing behaviors that benefit the parasite, or kleptoparasitism, in which the parasite steals food or other resources from a host. Parasitic symbiosis appears in many forms; some are relatively non-threatening, for example, ectoparasites, such as fleas, which feed off the blood of larger animals and may cause uncomfortable itching. However, the ectoparasite may act as a carrier or vector, which transmits intercellular endoparasites such as bacteria and viruses to the host, often causing significant damage or death. Brood parasitism, a form of kleptoparasitism, can impose a significant cost on the fitness of the host. This is common in birds (most notably in cuckoos), insects and some fish, where the parasite lays eggs within a host’s nest, and subsequently receives the food or shelter intended for the host offspring. Brood parasitism can result in high numbers of offspring death, either due to starvation, rejection of the offspring or the abandonment of nests by the host parents, or by parasites removing host offspring from nests. It has been hypothesized that a parasitic symbiosis may be evolved from other, more benevolent forms of symbioses; one partner may begin to exploit a previously mutualistic relationship by taking more of a resource or service than is returned, or by not contributing benefits to the partnership at all. Corals are made up of animals called corals polyps. Coral polyps have highly specialized obligate mutualistic symbiosis with photosynthesizing algae called zooxanthellae (pronounced “zoo-zan-THELL-ee”), which live inside the coral tissue. The zooxanthellae capture sunlight and convert it in to oxygen as well as energy, in the form of sugars and lipids that are transferred to the coral tissues and provide it with nutrients to survive and grow. In return, the zooxanthellae are provided with carbon dioxide, phosphorous and nitrogen as the by-product of the coral’s metabolic process. Although the corals cannot survive without any zooxanthellae, they can alter the amount within their tissues, by altering the amount of nutrients that the algae receive. However, if the temperature of the water becomes too high for an extended period of time, the corals undergo stress and expel all of their zooxanthellae and are not provided with enough nutrients to survive. This results in coral bleaching. Many fish become infected by ectoparasites, which are spawned in the water and attach to the skin and glands to feed off the host’s blood. Some highly specialized species of fish have evolved a facultative mutualistic symbiosis with many species of larger fish, whereby they remove the ectoparasites from the larger fish, providing a ‘cleaning’ service. An example is the Bluestreak Cleaner Wrasse (Labroides dimidiatus), tropical fish who wait at ‘cleaning stations’ that the larger fish visit in order to have their parasites removed. The cleaner fish perform a special ‘dance‘, which attracts the host fish, and advertises the cleaning service. Although the cleaner fish put themselves into apparent great danger by swimming inside the mouth cavities of even the most voracious predators, the service that they provide is so effective that they are very rarely harmed by the host fish and conduct repeated ‘customer’ visitations. The Cordyceps fungus (family: Cordycipitaceae) is a particularly widespread and deadly fungal endoparasite of insects and other arthropods, which infects its host, replacing all of the host’s tissue with its mycelium. Eventually, the ascocarp, the fruiting body, erupts out of the host’s body and releases the reproductive spores. Most Cordyceps are specialized on a single host species. 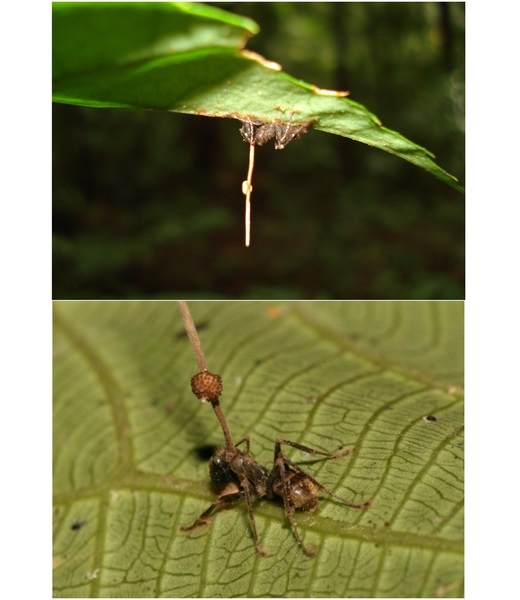 The ‘zombie fungus’, Ophiocordyceps unilateralis are specially adapted to parasitize the carpenter ant, Camponotus leonardi. The spores of the zombie fungus attach to the ant, and break into its tissues using enzymes; the behavior of the ant is then manipulated by the fungus. The ant breaks away from its colony on the forest floor, climbs up the stem of a plant and lodges its mandibles unnaturally deep into a leaf. Once attached to the leaf, the ant becomes immobilized and the fungus starts to take over the tissues, preparing to reproduce via its fruiting body. The fungus is highly sophisticated, having elevated its host high up so that its spores can be dispersed further than if the host were on the ground. Evolution – The gradual change in characteristics or genes within and between species. Competition – The interaction between two or more species that results from both (or all) attempting to exploit a resource. Predation – The process of one animal capturing and feeding on another ‘prey’ animal. Altruism – Behavior of animal that benefits another, either with no benefit or with detriment to the original animal. B is correct. Parasitism benefits one organism while inhibiting, killing or damaging the other. B is correct. The larger hosts receive a cleaning service, having their ectoparasites removed, while the cleaner fish eats the ectoparasites and receives a resource in the form of food. D is correct. The symbiosis between corals and their photosynthetic zooxanthellae is obligate. The corals cannot survive for extended periods of time without the algae, as they cannot produce all the nutrients they need independently. 4. What type of symbiosis does ‘commensalism’ involve? C is correct. Commensalism is symbiosis between two partners, where one gains from the interaction while the other is unaffected. This can be seen in animals that eat waste products of other animals, or that receive transport without hindering the movement of their host.